I recently scanned another roll of negatives from last year and found this photograph. I like the way it shows a sense of space and dimension. Even though I think it’s totally different from what I saw in the viewfinder. 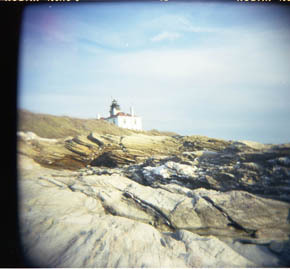 When using the Holga, I usually shoot the same scene with my digital. I didn’t with this one. Taken with a Holga 120N using Kodak BW400CN film. Here’s another from my last trip to Beavertail. Taken with a Holga 120N camera on Kodak 400NC film. Springtime view of Beavertail Light in Jamestown, RI. 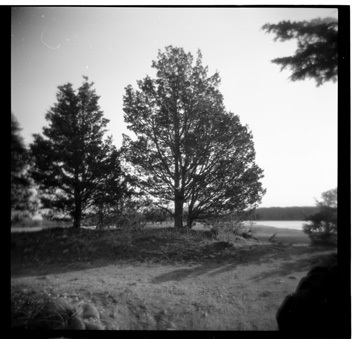 I finally scanned the negatives from my Holga and thought I’d upload this. 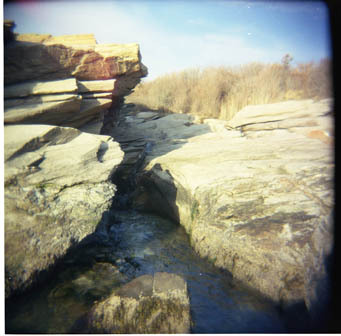 Taken with a Holga 120N Camera using Kodak 400NC film. Just before the storm, I managed to get back inside with the camera. This is one from July that I’m preparing for an exhibit. Taken with a Canon 40D. Somewhere on Rt. 295, No I wasn’t driving!